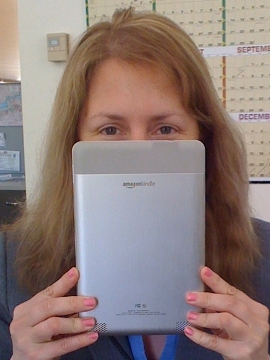 (Peggy Nelson, a new media artist and blogger, tells us about her Kindle. -- Levi). I hadn't meant to get one. A Kindle. But when we got one at work, to "evaluate," my curiosity got the better of me. In my day job I'm an user experience designer for educational technology, where we create and evaluate online courses, games, simulations -- as well as new delivery models, like augmented reality assignments, smartphones, mash-ups, e-readers, virtual worlds, and whatever else rolls out. Plus my friends have been (somewhat heatedly) debating the relative merits of the Kindle online, and I wanted to "evaluate" one for myself. The first thing I noticed about it was its "objectness:" it's light and thin, more like card stock than hardware. The soft grey screen creates a Peaceful Reading Environment, easier on the eyes than the harsh glow of an LCD. And the screen's small size is better in real life than its profile photo; it actually didn't feel small, it felt like a *page. Or I should say, it *read like a page; each screen gives you about 3 good Evelyn Wood-style scans. Onward from the object to the experience: I read Lauren Weisberger's "The Devil Wears Prada," Lytton Strachey's "Eminent Victorians," and am in the middle of Jonathan Lethem's collection of essays, "The Disappointment Artist." Also tried out LitKicks, as well as some magazines and newspapers, and accessed a monochrome Google. Pseudo-speed reading in greyscale, I could *almost lose myself in the story, although not completely. Perhaps that was because I am so used to turning pages; pressing the 'next' button does require fewer muscles, but it is a much newer behavior, so there was a heightened self-consciousness about the experience. Although -- it was not so heightened as to be a deal-breaker, and the newness (or the awareness of such) would perhaps fade with use. That's compared to books. Compared to reading onscreen it's *significantly* better. I'm online all day, and a reader, but if I have to read anything onscreen longer than a few paragraphs I like to escape from the screen and print it out. It's not so much that it bothers my eyes as it bothers my attention span. The Kindle didn't trigger the escape button in the same way, despite the fact that it does have the web. Overall I find the Kindle to be more of an icon linking back to the book, than a full-blown substitute: if I liked something, I wanted the 'real' object to own, afterwards. As if I had to 'bookend' the experience with a real book! Which is probably good news for the publishing industry, if representative. I still imagine there's something "alive" about a book on the shelf, which is paradoxical because the *real life of a book is fully virtual. Language has been flowing in and out of various forms for thousands of years, from speaking to pictures to writing to -- code? And beyond, inevitably. However, there is something significant about edges. A codex satisfies the analog part of our nature, both the real periphery of our vision (both pages at once) and the virtual periphery of our perception ("flipping through it" to any page, what's next to it on the shelf, etc.). A somewhat similar experience even holds with websites - with the Kindle, the layout is replaced by a list. Most of the 'page elements' are there, eventually, but in *sequence, not in simultaneity. And with sequencing comes a denial of the virtual periphery: you can scroll or click through, but the page you were looking at is cleanly gone, and the pages you might see next do not yet exist. You can't hold on to them, except via trust in (Random Access) Memory. When we lose the edges we lose the analogies, the associations, the as-yet unknown possibility spaces. When we target too closely the known, we lose the jumping-off point for all else. So I welcome the Kindle, but cautiously: as an *addition* to my library, but not as its replacement. 9 Responses to "Trying the Kindle"
The last line was thought provoking... an 'addition' to the library... yes, i understand our need for holding something tangible with a smell and feel that speaks to us as our books have always done and most certainly will continue to do far into our futures. But we cannot eschew the future with what we now refer to as ebooks no more than we can refuse the PC and whatever form it will take in that future... the two will live in harmony. Those who are but yet children will grow up using both (and quite possibly more tech-knowledgies) to learn from and with in what we all have done to further our own education, entertainment and enlightenment. Bravo for your clear expose on a subject about which I'm more than curious. Like your previous commentator, I'll try it out, but like you, I suspect I will not be hooked. Too old to change habits, for one thing. I would get one only for my tiny technical library. I will abandon my Excel book just to save on baggage space. Charlie Rose said when he interviewed Amazon's CEO that he saw someone using a Kindle on every flight he took. I like books better than reading off a screen. It's secondary function as solid state yasmak has its attractions , but you wouldn't want to read too much into that. Duncan, you know the old cliche about spying on someone through a hole in a newspaper? Well, nowadays, you can mount a tiny camara on the back of a Kindle and watch your suspect onscreen! This is useful both in espionage work and just plain fun on the bus! We've thought about purchasing one to try out at work as well... I want to hate the Kindle, but I can't help thinking about how much paper it will save, and how much less expensive publishing will be for up and coming writers. Bill, so we all get to be James Bond for fifteen minutes,and or a voyueristic pervert, instead of reading Fleming. With a soundtrack attached it would be possible to write, read and view our own novel hot off the Kindle. warren's point is still valid, having a book in our hands is superior wisdom. Shape, colour, texture. design and imagination is art in our hands. "When we lose the edges we lose the analogies, the associations, the as-yet unknown possibility spaces. When we target too closely the known, we lose the jumping-off point for all else." Well put. This is a boon of the internet/hyperlinking (the benefits from associations/jumping off points) -- and I think, a loss that is feasibly worth mentioning regarding the move from book to Kindle. Perhaps the kindle suffers from both the loss of associations that a book can grant, and a lack of the jumping off points that a strongly-internet connected device would have. Accordingly, advances in this sort of device may some bring this flexibility back.